(born August 13, 1926) is a Cuban politician. 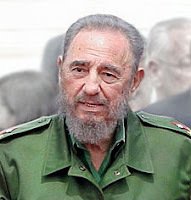 One of the primary leaders of the Cuban Revolution, Castro served as the Prime minister of Cuba from February 1959 to December 1976, and then as the President of the Council of State of Cuba until his resignation from the office in February 2008. He served as First secretary of the Communist Party of Cuba , from 1965 until 2010, when he retired for health reasons.